BNP acting chairman Tarique Rahman joined the nomination board using a telecommunication app as the party started interviewing its nomination hopefuls for the fourth consecutive day on Wednesday, UNB reports. The interview of the BNP nomination aspirants will conclude with today’s interview. 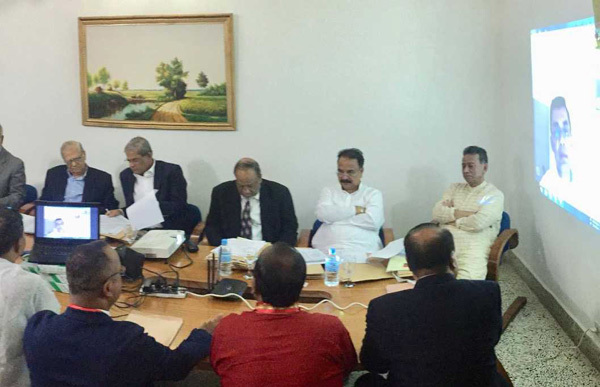 The party nomination board, comprising BNP standing committee members, started the interview with those who bought party nomination forms for Mymensingh and Faridpur districts at BNP chairperson’s Gulshan office at 10 am. BNP secretary general Mirza Fakhrul Islam Alamgir, standing committee members Khandaker Mosharraf Hossain, Moudud Ahmed, Jamiruddin Sircar, Gayeshwar Chandra Roy, Abdul Moyeen Khan, Nazrul Islam Khan and Amir Kahosru Mahmud Chowdhury, Mahbubur Rahman and Mirza Abbas are present there in the nomination board. Though the authorities concerned blocked telecommunication application Skype on Monday the nomination seekers who faced interview said Tarique joined the nomination board on Tuesday as previous days using another telecommunication application. Earlier on Monday, BNP alleged that Bangladesh Telecommunication Regulatory Commission (BTRC) blocked telecommunication application Skype across the country after Election Commission Secretary Helal Uddin’s remarks that the Commission has “nothing to do” with BNP acting chairman Tarique Rahman’s involvement in the nomination processes of the party.